Old weathered barnboard painted with quaint country sayings to direct visitors, make a statement or just get a giggle are the very best of whimsical garden art. Here's some garden sign sayings to give you some ideas of what to paint. Barnboards, weathered to perfection are the ideal place to start. Using acrylic paints and spray on Varathane makes them sturdy and weather proof; if you want to make them almost completely impervious to weather, hang them under the eaves of a roof. I use barnboards or lumber salvaged from other carpentry projects to make a garden sign or two, and paint funny sayings, directions or a picture to enhance my garden visitors’ experience. I love to delight and surprise people with witty puns, on a piece of unique garden art. 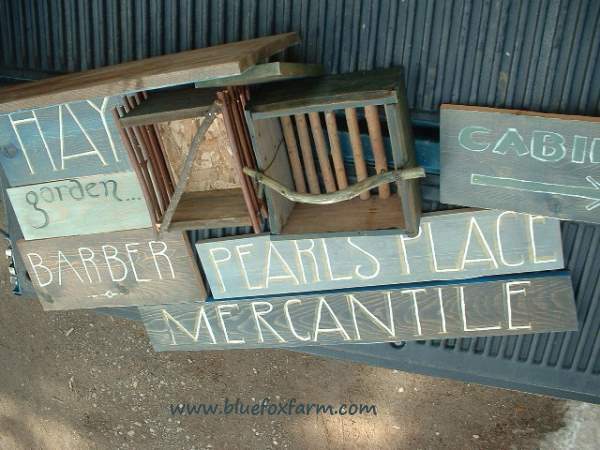 To make your rustic garden signs, find a piece of salvaged lumber or barnboard. 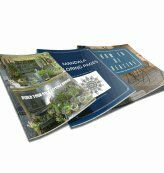 I prefer thinner pieces such as planed ½ inch or one inch thick by 4-6 inches across. 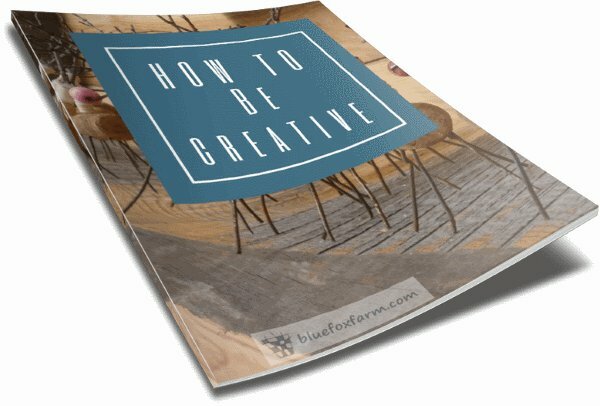 If you know what you want your sign to say, estimate how your lettering will fit the board. It’s really hard to figure it out as you go, so if you have to, find a piece of paper the same size and sketch the lettering on that. 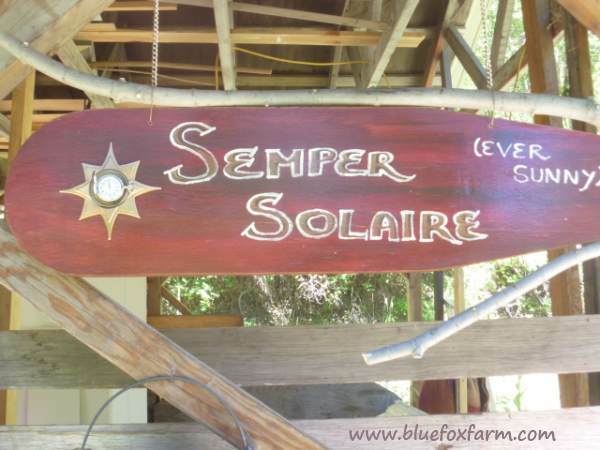 Semper Solaire sign - this is an old plywood ironing board, embellished with an escutcheon (decorative backing for a door handle) and a pocket watch. There’s nothing more frustrating (and harder to fix) than scrunching up the final few letters to make them fit. Prepare your board by sanding off the rough spots, or if you have to, use a power sander to make it smoother. Don’t overdo it or it will lose all its rustic appeal and patina. The goal is to make it easier to paint on, not to eliminate the character and charm. Using thinned down acrylic craft paint that you can buy at the dollar store or in craft stores, rag on your preferred colour of background. This can be any colour you like, as you will be adding more on top. Allow the first coat to dry, and then add a different colour in the same way, by ragging it on, then wiping it off. These two coats will form the base of your rustic garden sign, so make them compatible with other colors in your garden. Once the second coat is dry, using fine grit sandpaper, take off some of the top coat. This will reveal the lower coat, plus in some areas (especially around the edges for instance) you will reveal the actual wood. If you want, you can use a really diluted coat of darker brown, green or black to stain the lowest layers and make them appear more aged. The distressed look depends on the appearance of weathering. The good thing is, if you don’t like it, simply start all over again. If your weathered barnboard has knotholes or cracks in, the paint will fill these and resist being sanded off, making it resemble an ancient farm sign or one found on an old western hotel or bawdy house. This is the look that I aim for, the more weather beaten and distressed, the better. Using a small paintbrush, load up a slightly diluted acrylic paint, and using fluid brushstrokes, paint your lettering. Don’t try and touch up any mistakes until it’s dry, or it will be very obvious. Once it’s dry, go back over it with a small piece of sandpaper if there are blobs, blank spots, or mistakes, and then re-touch with the same colour. Once that layer is dry, you can outline with a lighter colour and a smaller brush, or make a shadow effect. Allow that to dry too, and then sand the whole thing, taking some of the lettering off almost completely. Use a tack cloth (clean dry lint free cloth) to get rid of any dust, then you can spray the whole thing with spray on Varathane sealer. Hang your sign with wire by stapling two small fence staples into the top of the sign, or nail directly to the side of a building, or use a post to insert it into the ground. 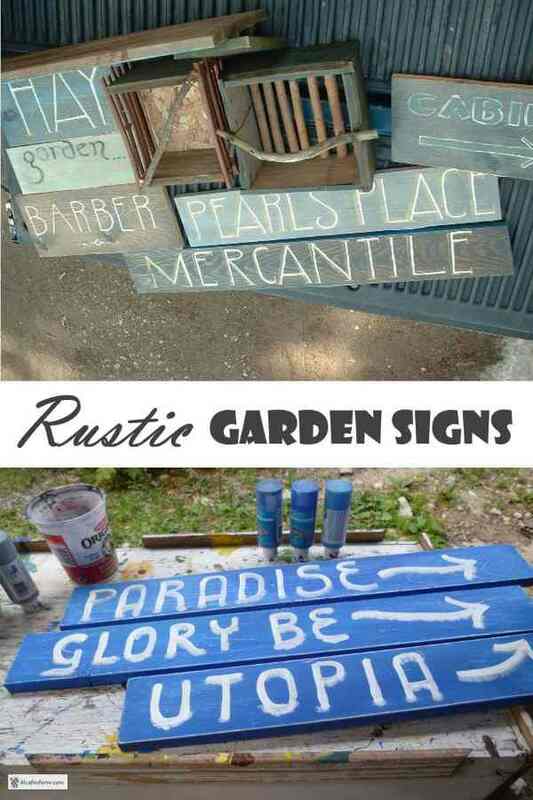 I’ll bet your visitors will enjoy your rustic garden signs almost as much as you do.